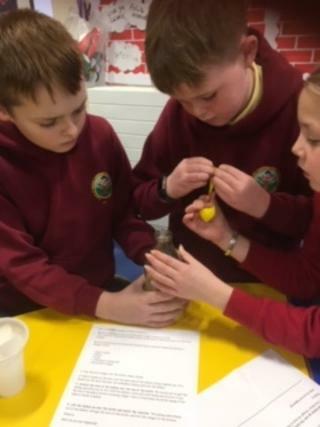 Concoctions - Mixtures, Medicine or Magic? We had a great time mixing our very own 'mocktails'. 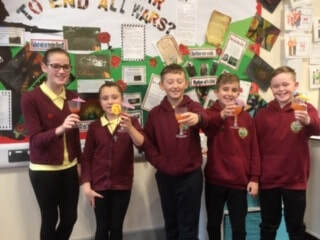 They had to be healthy, so used fresh fruit, fruit juice and sparkling water. Our concoctions tasted great. We even did some market research to see which mocktail was the most popular. 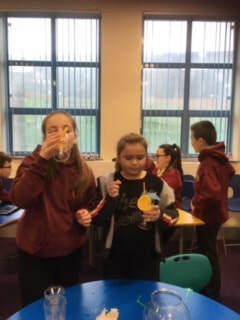 We have also investigated Solids, Liquids and Gases as part of our topic. 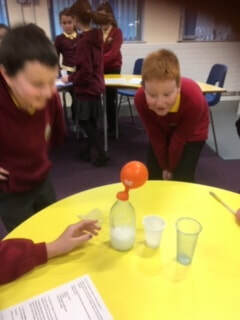 We made a concoction which created carbon dioxide which inflated a balloon. We will continue to work using Big Maths strategies and will regularly have our CLIC tests. In addition to this, we follow the Active Learn Scheme of work to ensure we cover everything we need to learn to develop our Numeracy skills. Please encourage your child to use the Active Learn website to practise maths in a fun and interesting manner. The Digital Competence Framework requires all pupils to be competent in ICT and achieve certain standards. ​We are confidently able to use a range of Office 360 tools including Sway. ​We use Hwb on a regular basis and we can all access this shared learning platform, even at home, using our passwords. ​We have participated in the Hour of Code and have used Skype to contact schools around the world. We are using the Giglets site as part of our reading. It has many wonderful books to which the children have free access. Already we have written through a range of genres: diaries, poetry, letters, stories with flashbacks and biographies.